1. Someone who rejects the need for a system of government in society and proposes its abolition: The anarchists at the university campus sought to occupy the offices of the administration and to disrupt the operations of the university. 2. Any one who tries to overthrow a society’s formal system of government or behaves in a generally lawless manner and encourages others to do the same: Some anarchists wrote a book which suggested ways to overthrow legitimate establishments. 1. The absence of any formal system of government in a society: After the revolution, there was a period of anarchy when no one seemed to be in charge of the government. 2. A situation in which there is a total lack of organization or control: In the wake of the riots, it appeared that total anarchy prevailed. 3. Political disorder and violence; lawlessness: The history book provides accounts of several periods of political anarchy which occurred in the twentieth century. 4. Disorder in any sphere of activity: While looking through the microscope at the microbes, it appeared that a state of anarchy among the microbes prevailed because of the introduction of a negative substance. When the rich assemble to concern themselves with the business of the poor, it is called charity. When the poor assemble to concern themselves with the business of the rich, it is called anarchy. Loss of articulate speech: As the result of the operation on his larynx, Percy suffered a temporary anarthria, but later he regained his speech. The absence of molting or having a prolonged intermolt period: Anecdysis is a condition of having no shedding of an outer layer of skin on a plant or an animal that covers and protects it; such as, by insects, crustaceans, and snakes. Relating to being without echoes: The scientist was experimenting with the absorption of sound waves and radar signals in a special anechoic chamber. A condition in which a person's blood does not have enough red corpuscles; the severity of which is usually determined by how much the red blood cells have been decreased because when there is inadequate hemoglobin (iron-containing pigments of the red blood cells), all parts of the body receive less oxygen and have less energy than is normally needed to function properly: The results of the blood work done by Dr. Nelson indicated that Lora was suffering from anemia. The degree of anemia in Percy alarmed the doctor and so she prescribed medications. 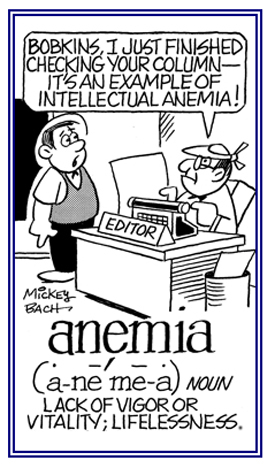 Many people who are suffering from various degrees of anemia are often pale, lifeless, and lacking in energy or vitality. A lack of necessary nutrients or substances to make healthy blood: Muriel's anemotrophy resulted in the development of anemia (low red-blood cell counts) because of insufficient production of red blood cells by her bone marrow. 1. Congenital defective development of the brain that includes the absence of the bones of the cranial vault: The baby was born with anencephaly which was a birth defect in which most of the brain and parts of the skull were missing. 2. A partial or total absence of the brain at birth: Doctor Darrin indicated that there are some babies who had been born with anencephalies at his hospital. Lacking intestines: Tapeworms are one example of anenterous creatures that do not have intestines. The absence of a protein that is manufactured by a cell, and which is a catalyst in various biological functions: Having anenzymia, or the lack of enzymes, hinders the break down of larger molecules of starch, fat, and protein during digestion. 1. A lack of reaction by the body's defense mechanisms to foreign substances: Anergy is a condition in which there is immune unresponsiveness. Anergies consist of losses or suppressions of normal immune system functions. 2. Inactivity or extreme passivity: The anergy of Jasmine resulted in her having a severe lack of energy and so she could barely walk around or do anything except to stay in bed or to continuously sit. 1. An instrument for measuring atmospheric pressure that operates without liquid: An aneroid is a device that automatically records changes in air pressure with the movement of a pressure-sensitive element without the use of any fluids. 2. Etymology: from Greek a, "without" + neron, "water" + oid, "like". "The word neron is derived from the Late Greek phrase neron hydor, "fresh water". Relating to or referring to being without fluid or actuated without a flowing substance: The aneroid barometer measures air pressure by the action of air and not by using liquids. Showing page 11 out of 23 pages of 340 main-word entries or main-word-entry groups.